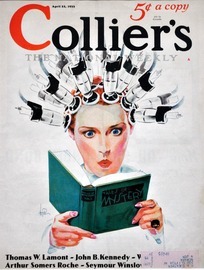 Collier's is an American magazine, founded in 1888 by Peter Fenelon Collier. It was initially launched as Collier's Once a Week, then changed in 1895 to Collier's Weekly: An Illustrated Journal, then shortened in 1942 to simply Collier's. The magazine ceased publication with the January 4, 1957 issue and didn't resume again until it was revived in February 2012.